WASHINGTON — Saudi Arabia’s government is discussing a plan to admit that missing journalist Jamal Khashoggi was killed after entering the Saudi consulate in Istanbul, three people with knowledge of the situation tell NBC News. Such an off-ramp could provide a way for Saudi leadership to save face and explain away their previous insistence that Khashoggi wasn’t killed in the consulate and indeed left the building shortly after he entered nearly two weeks ago. One of those two individuals said he was told by those close to the Saudi leadership that the kingdom will claim that rogue operatives killed Khashoggi during an interrogation or a rendition attempt that went horribly awry. The third individual said the U.S. government still doesn’t know precisely what explanation the Saudis plan to give, but that the Saudis intend to admit "culpability." The individuals weren’t authorized to discuss the situation publicly and requested anonymity. Khashoggi vanished on Oct. 2 after entering the Saudi consulate in Istanbul. The journalist was a one-time Saudi royal family insider turned critic who left the nation last year and began writing pieces for The Washington Post. 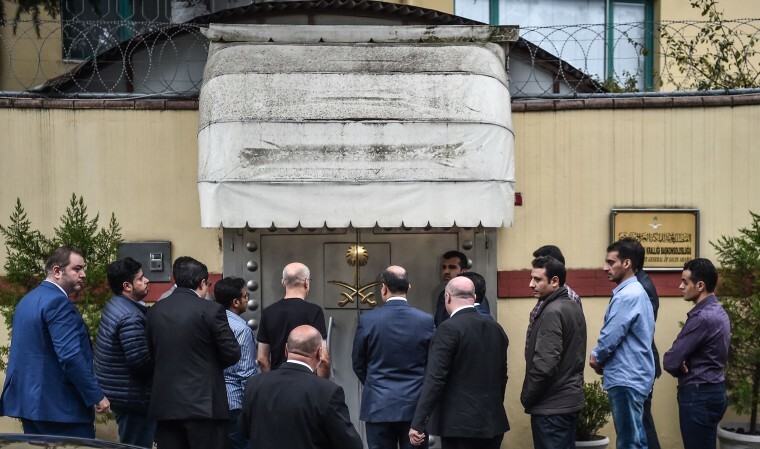 Turkish investigators from a joint Turkish-Saudi team set up to look into Khashoggi's disappearance were allowed into the Saudi Consulate for the first time since the writer went missing nearly two weeks ago, according to a Turkish individual familiar with the investigation. Investigators entered the consulate late Monday night and left before sunrise on Tuesday morning. They spent about nine hours inside the consulate. Investigators included forensic teams looking for DNA samples. They also removed soil samples and bricks from the consulate ground. They were not allowed to interview any Saudi staff. It was not clear if they had access to all of the consulates rooms, this person told NBC News. Hours before the investigators arrived at the consulate, cleaning crews were spotted entering the building. Word of the Saudi plan comes as Secretary of State Mike Pompeo arrived in Riyadh to meet with Saudi King Salman about the disappearance. The possibility of a Saudi shift in explanation is expected to be discussed directly with Pompeo. On Sunday, President Donald Trump spoke by phone with King Salman, who is the crown prince’s father. Trump told reporters on Monday that it had sounded from the conversation with the king "like maybe these could have been rogue killers — who knows?" CNN and the Wall Street Journal reported earlier Monday that Saudi officials were discussing such a plan. Asked directly about those reports, Trump said later Monday "I just don’t know" and added that he’ll have to see what the Saudis say. A spokeswoman for the Saudi Embassy in Washington did not immediately respond to a request for comment about the discussions. Khashoggi's family issued a statement Monday calling for the "establishment of an independent and impartial international commission to inquire into the circumstances of his death." "We are sadly and anxiously following the conflicting news regarding the fate of our father after losing contact with him two weeks ago, when he disappeared after entering the Saudi consulate in Istanbul," the statement said. "Our family is traumatized, and yearns to be together during this painful time." Following Khashoggi's disappearance, a slew of businesses leaders and media companies announced they were pulling out of the Future Investment Initiative economic conference set for next week in Riyadh.